Ready? Heston Library opens in 1 month! Our volunteer team is more than halfway done on the Heston makeover project! 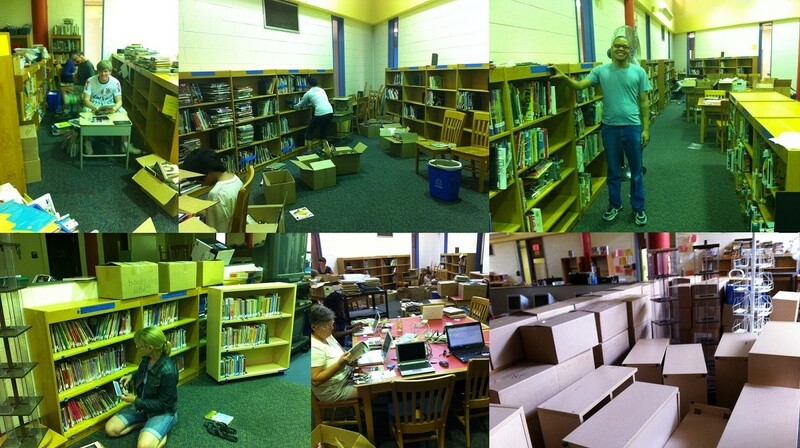 The mighty moving volunteers transported over 100 boxes of library books and a dozen+ pieces of library furniture from Leidy School to Heston. The cataloging team removed more than one thousand worn-out books from Heston’s shelves (and computer records), and we donated several large book deliveries to Books Through Bars, for folks in prison and for community members to read and re-purpose books for creative projects. The team de-installed sets of warped and water-damaged bookcases, replacing them with newer shelves that are more accessible for young children to browse books. The library collection now includes new sections—a wall of “Easy Fiction” books with beginning chapter books and series popular with first to fourth graders, and a “Story Collection” shelf where volunteers can find fun selections to read aloud. The team has been working on half a dozen computer workstations to create labels and new computer records for incoming books—Heston’s library collection will serve students for years to come! I (Mica) want to send a BIG Thank You to all WePAC volunteers. My deepest thanks go to our summer team, including… (deep breath)– Ariel Baumet, Barb Smith, Brenda Bott, Bruce and Sherry Shaeffer, Cathy Tullman, Colleen Gallo, Connie Hoelscher, Cristine Perry, Dianne Williams, Dorian Dean, Elliott, Anna Taylor, Debi Lynch, and the Girl Scouts, Faithe Hornung, Fred Lovitch, Heston facilities staff, Janet McMaster, Jenny Steinen, Jim Remson, Joslynn Tramell-Debrow, Lianna Zolkower-Kutz, Linda Hasert, Morgan Rogers, Nancy McClennahan, Pam Fried, Principal Edwards, Sarah Vitale, Sohee Kempf and Aiden, Suzanne Fabricant and Vicky Dougherty, Tarik Linthicum, and Teacher Fields.